Warwick is a community made great by the people who care about the future of our town. An exciting project is about to transform Stanley-Deming Park into a playful paradise, and we need your help. We are excited to offer families, businesses, and organizations a chance to play a larger role in this project by sponsoring specific components of the playground. Thanks to our fiscal sponsor the Community Foundation of Orange and Sullivan, all donations to the project are tax-deductible. 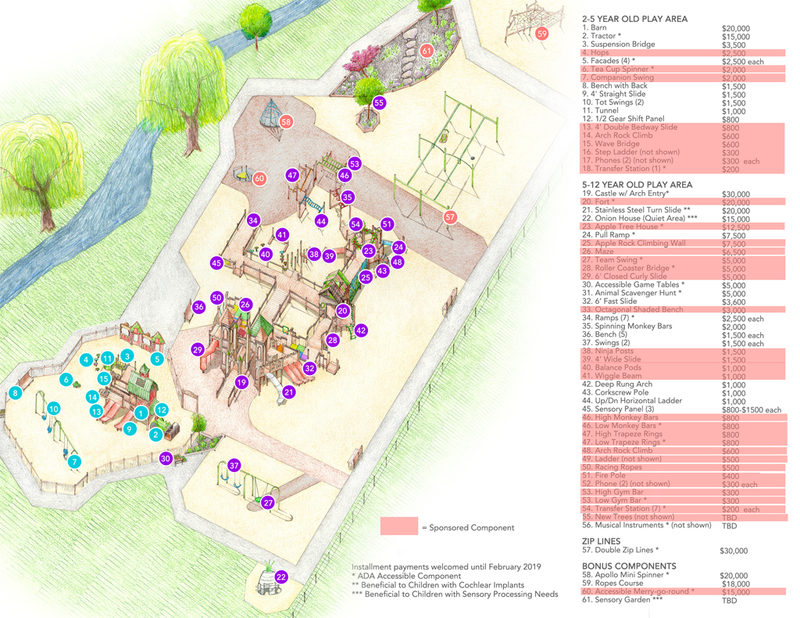 All donors will be recognized at the playground site, while donors who contribute $5,000 and up will be acknowledged with a plaque placed near the donated piece, thanking their business or family. Is there a piece of equipment you are especially excited about but is outside of your budget? Multiple businesses or community members can pull together to sponsor one large playground piece! Component sponsorships may also be paid for in installments up to February 2019. Our fiscal sponsor can also help set up employer-matched donations. Please reach out to us at warwickplaygrounddreams@gmail.com with any questions we can answer for you. This barn-raising event, scheduled for April 22-28, 2019, will long be remembered in our community. Thank you for helping us make our children’s dream become reality! Is there a piece of playground equipment you are especially excited to sponsor? We are pleased to offer installment payments until February 2019! We would be happy to help you set up your donation as monthly or quarterly payments.